Smoke Bend is an unincorporated community in Ascension Parish, Louisiana, United States. A small cottage from the 1870s named Rome House, listed on the National Register of Historic Places, is located here. ^ "placenames". www.placenames.com. Archived from the original on 2012-08-06. 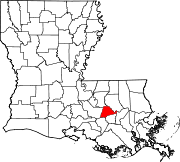 ^ "Smoke Bend, LA - Smoke Bend, Louisiana Map & Directions - MapQuest". www.mapquest.com. This page was last edited on 21 May 2018, at 17:34 (UTC).